TS SSA SG/MG Utilization Guidelines/Norms for School Grants, Maintenance Grant, TLM Grant, school complex grant, MRC Grant, contengent fund : Release of Composite School Grant to Govt. & Local Body Schools during the year 2018-19 (1st & 2nd Installments) - GEN-SC-ST Components School wise amounts released details TS SSA Schools Annual Grant and Maintenance Grant Utilization Guidelines 2018-2019 Annual Composite School Grant to TS Schools for 2018-2019, Guidelines for Utilization of Annual Composite School Grant, Guidelines for Utilization of funds. TS SSA Grants for TS Schools, SSA Grants for Telangana Schools, Grants Utilization Guidelines, Samagra Shiksha School Annual Grant utilization Guidelines , Samagra Shiksha Maintenance Grant utilization Guidelines, Guidelines on the utilization of Grants 2018-2019 TS SSA Grants for TS Schools, SSA Grants for Telangana Schools, How to use annual grants i.e. 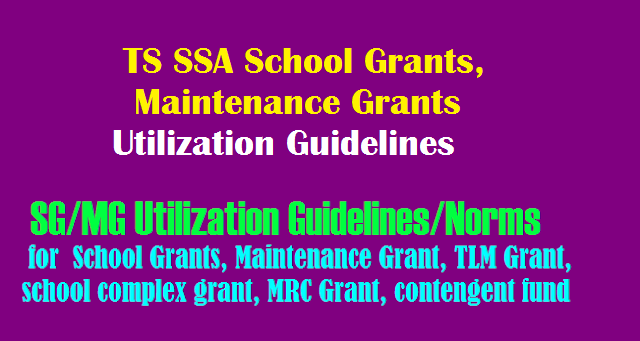 School Grants,School Maintainance Grants released by SSA Utilization Guidelines, School Annual Grant, Maintenance Grant Sarva Shiksha Abhiyan, Telangana, Hyderabad Guidelines on the utilization of Grants ,Telangana State SSA School Grants Utilization Guidelines. స్కూల్ గ్రాంట్స్ కు ఇక నుంచి PS/UPS/HS అనే తేడా మరియు రూమ్స్ తో సంబంధం లేకుండా కేవలం విద్యార్థుల సంఖ్య ఆధారంగా స్కూల్ గ్రాంట్స్ మంజూరు అవుతాయి. విద్యార్థుల సంఖ్య ఆధారంగా 2018-19 స్కూల్ గ్రాంట్స్ విడుదల అయినాయి . TS SSA స్కూల్ గ్రాంట్స్, నిర్వహణ గ్రాంట్ యుటిలైజేషన్ మార్గదర్శకాలు / నియమాలు 2018-2019 పాఠశాలల వారీగా విడుదలైన 2018-19 గ్రాంట్ వివరాలు ఇక్కడ ఉన్నాయి. ★1.Purchase of games & sports material. ★2.Procurement of science lab material, games and sports material in case of upper primary and high schools. ★4.Purchase of soap liquid and towels for hand washing of children. ★6.Provision of stationary for conducting exams. ★1.Payment of electricity bills per month for primary for upper primary and upper primary sections of high schools. ★4.Maintenance of drinking water facility and providing potable water wherever permanent source of drinking water facility is not available. ★1.Cell phone charges to School Complex Head Master @ Rs.200/- per month for 12 months – Rs. 2,400/- per year. ★2.Providing Tea and Refreshments to the participants @ Rs.300/- per month – on an average Rs. 3600/- per year. ★4.Melas, Talent Search Examinations, Documentation, Water and other contingencies etc. prizes / food or chocolates to children – Rs.2000/- per year. ★2.The SMC shall make resolutions to utilize all types of grants (except MRC) on the above mentioned items and the resolutions shall be minuted accordingly. ★3.Social audit shall be done by SMC on utilization of the grants. ★4.Stock and Issue Registers shall be maintained for the items procured and utilized. ★5.Expenditure and balance available shall be displayed on the notice board. ★7.Cash book and vouchers shall be maintained for all the transactions. ★9.Complex Headmaster & Asst. Secretary at Complex level and MEO at MRC level. ★10.School Complex and MRC grants shall be drawn every month as per monthly requirements only. ★11.The DIET, DPO staff, MEO shall monitor the utilization of grants and record in the academic guidance register and furnish report to the DPO and SPO. Necessary action may be taken based on the observations made during their visits. ★12.The State Level Observers shall also visit sample schools, MRCs and School Complexes and observe the utilization of grants and recommend appropriate measures and action..